An incredible recipe by an incredible chef using our organic green powder aka the best green tea powder in Australia (we think). For those who are new to our Matcha Maiden family, or have many of our most recent matcha-updates, we were lucky enough to be 1 of 5 business chosen to be a part of Chobani Australia’s FIRST EVER cohort for their brand new Incubator Program. Due to it’s success in the U.S., the Chobani team decided to bring it to Australia and share the love and knowledge here. We were SO honoured to be chosen from 100 or so businesses to be a part of the 4 month long intensive program, alongside our new-found friends at Kooee Snacks, Bake Mixes, Mingle Seasoning and 99th Monkey. (We’ll describe our experience in more detail in another blog post!) In the 3rd intensive week with Chobani, we were lucky enough to have had the incredible Chef Mauro, Chef-Patron of The Independent Gembrook, turn our organic green powder into a magical matcha panna cotta dessert! Not only is Chef Mauro the chef-patron of his Argentinian influenced restaurant, but he has worked with some of the biggest names such as Grill’d and Schnitz in developing their recipes and menu items. So, being able to put the best organic tea in Australia, in the hands of one of the most amazing chefs we’ve met, was a matcha made in heaven! 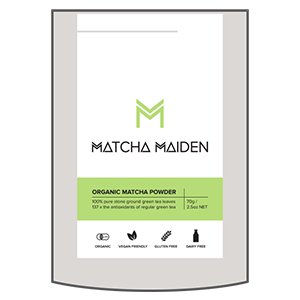 Chef Mauro has kindly shared his recipe with us, and our extended matcha maiden family! Bring milk, orange zest, cinnamon and cardamom pods to boil and simmer for 10 minutes then rest for 25- make sure this is cool before it is poured with the egg mixture as having it too hot with cook the eggs! Pour the milk mix over the egg mix and cook Bain Marie until the mixture reaches 70C. Pour the mix into ramekins and set overnight in the fridge (we may have gotten a little bit excited and not even let it set!. Serve with crushed peanuts and toasted coriander seeds. Let us know how you go with this recipe and make sure to tag us in any of your creations! Thank you so matcha to the incredible, Chef Mauro, for his generosity and creativity- we love you so matcha!